Slow cookers are my saving grace this time of year. There’s so much to be done with so little time to do it and the cold short days aren’t helping. The last thing I feel like doing after prying myself from the warmth of my cozy bed in the morning, working all day long, and then coming home when it’s already dark outside is having to cook dinner. On the flip side, I still want a healthy meal without having to waste money eating out. That, my friends, is where the wonderful slow cooker comes into play. 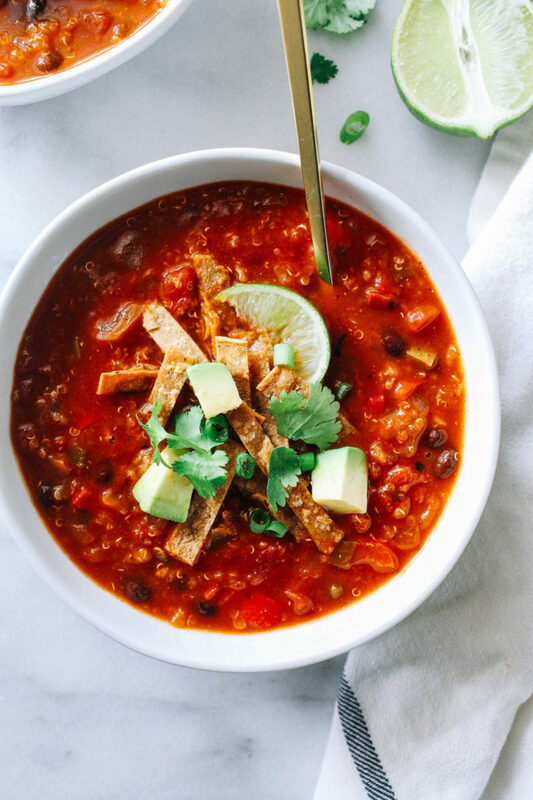 I made this black bean soup a few times earlier in the year and then put my slow cooker away in my guest bathroom (because I don’t have room for it in my kitchen, true story) and forgot about it until a few weeks ago. I guess that saying out of sight, out of mind really is true, huh? 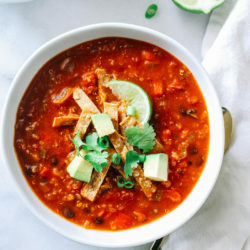 Anyway, now that I’ve managed to bust it back out let’s talk about the goodness that is quinoa tortilla soup. Outside of chopping veggies and opening a few cans, it’s super simple to make. 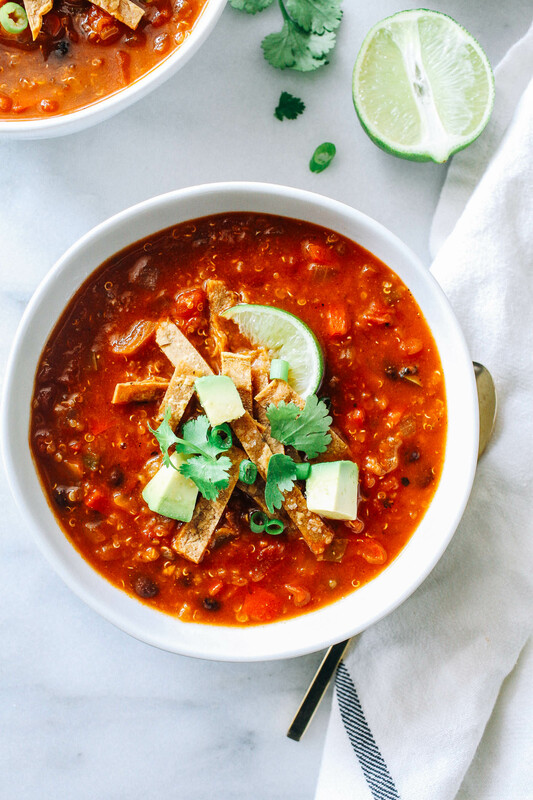 All you have to do is throw everything into the slow cooker and let it work it’s magic. If for some reason you don’t have a Crockpot, or you prefer not to use it, you can also make this on the stovetop. I’ve tested it both ways and it turned out great. You can find notes on how to cook it that way in the directions below! 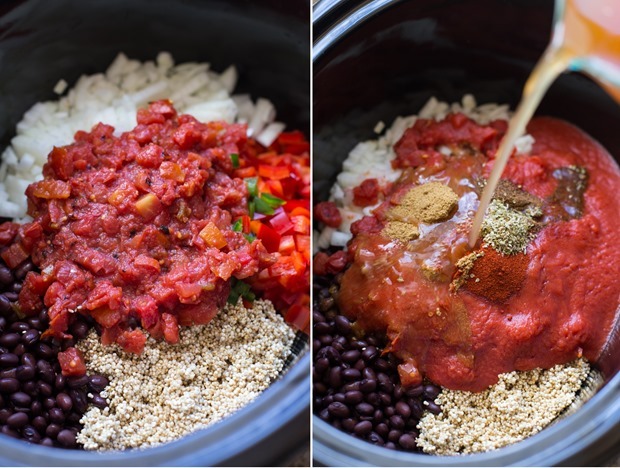 Place all of the ingredients (minus the toppings) into 6.5 qt slow cooker on the high setting. Stir together, cover and allow to cook for 6 hours. Keep warm until ready to serve. 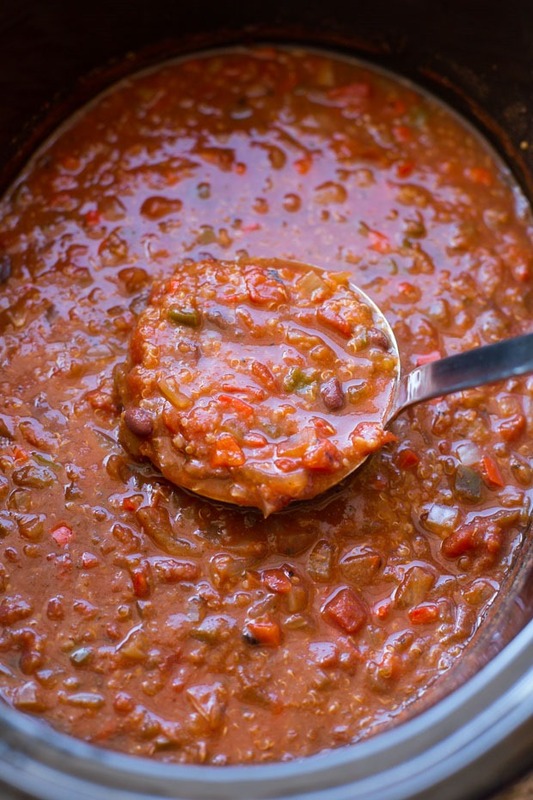 Distribute the soup into separate bowls and serve with desired toppings. Store leftovers in an airtight container for up to 4 days. In a large pot, warm 2 tablespoons olive oil over medium heat. Add the onion, sprinkle with salt and cook for 3 minutes. Add the peppers, garlic, and seasonings then stir to combine and cook for a few more minutes. Pour in the canned tomatoes with their juices, tomato sauce, vegetable broth and water. Bring to a low boil then add the quinoa and cook for about 20 minutes, until quinoa is tender. Add the black beans and cook until heated through. 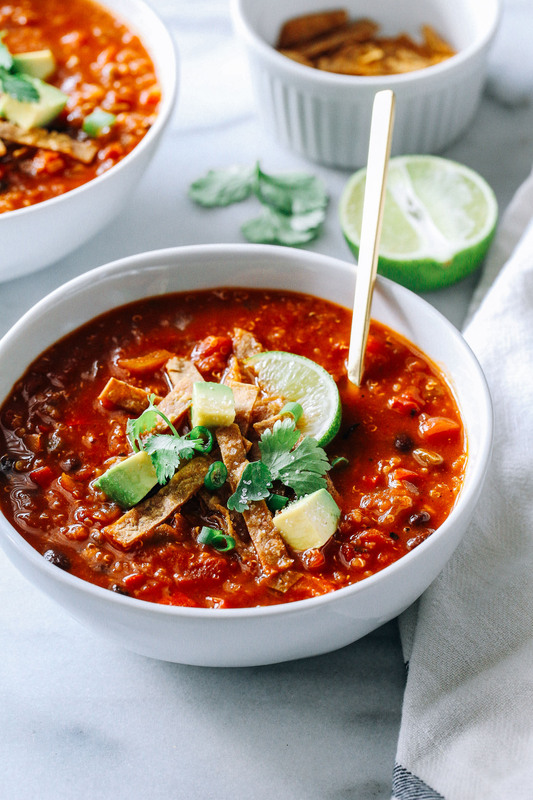 Serve warm with tortilla strips, lime juice, cilantro and/or avocado. *To make your own tortilla strips, stack 6 corn tortillas slice them into 1/2-inch wide, 2-inch long strips. Transfer them to a baking sheet lined with parchment paper and lightly coat with oil. Bake in the oven at 400°F for 5-6 minutes on each side, until light golden brown. Remove them from the oven, season with salt and allow to cool. 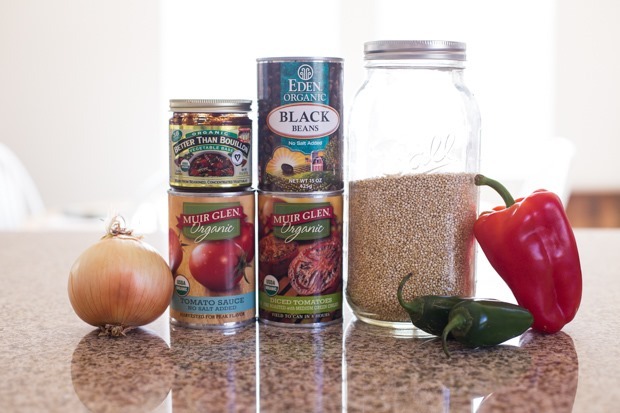 I recommend using BPA-free canned tomatoes and sauce (such as Muir Glen) as well as black beans (such as Eden Organics). Leftovers can be stored in an airtight container for up to 4 days, or frozen for up to 1 month.